The fall is officially here! With the fall seasons comes chillier nights, and if you want to spend as much time outside as possible, there’s no better way to keep way to keep your outdoor living space cozy and comfortable than an outdoor fireplace. Outdoor fireplaces in Dallas are becoming a popular trend. Typically, fall weather brings temperature low’s around the mid-40s — great weather to enjoy the warmth and ambiance of a patio fireplace. Outdoor fireplaces are continuing to grow in popularity, as they extend the livability of your outdoor space, helping you enjoy it more throughout the year. If you’ve been recently wondering how you can enhance your outdoor space, consider five reasons to seek outdoor fireplace installation services. Outdoor fireplaces in Dallas can be used just about any time of the year — they are great for the warmer months during gatherings with friends and family, but they also can be used when the temperatures begin to drop. Whether you live in a climate that is always warm or relatively cool, a patio fireplace will enable you to spend more time in your outdoor living space throughout the year. There’s something comforting about sitting next to your fireplace inside after a long day. With outdoor fireplaces, you get the warm and ambiance of a normal fireplace, but with a unique outside atmosphere. An outdoor fireplace adds beauty and a welcoming invitation to an outdoor space that can’t be matched by anything else. The warm glow of the flames creates a lovely and comforting ambiance. An outdoor fireplace gives you the perfect backdrop to cozying up and spending some quality time with friends or family — a little bit of warmth goes a long way. Adding a fireplace to your outdoor living space will make it an even more inviting and entertaining for guests. It’s the perfect area to sit together, chat, and have a few drinks. The warm glow and crackling of the fire can make any gathering more fun, relaxing, and entertaining. Outdoor fireplaces come in a variety of styles to fit in with your home and outdoor living area. Whether your home is of modern, traditional, rustic, or eclectic, you shouldn’t have trouble finding an outdoor fireplace for it. An outdoor fireplace can increase the market value of your home. Whenever you choose to sell your home, a outdoor fireplace will immediately catch a potential buyer’s eye and help your home stand out from others. Many people are continuing to brace the trend of maximizing their outdoor living space, which includes outdoor fireplaces. When it comes to adding accent pieces for your outdoor living area, a fireplace is a great choice. They add structure and definition to the space. The chimney of a patio fireplace can be a strong vertical focal point that elevates the eye and adds depth. An outdoor fireplace can adapt to many different design elements and styles and will enhance the appeal of your space. There are plenty of reasons to add an outdoor fireplace to your patio. If you are interested in learning more about outdoor fireplace installation, it’s important to find the right landscaping company that specializes in this service. 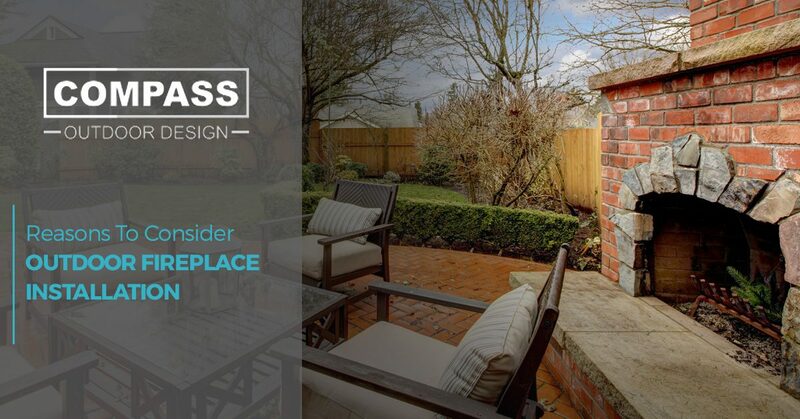 If you are searching for companies that install quality outdoor fireplaces in Dallas, look no the team at Compass Outdoor Design, a leading patio design company. We specialize in building the outdoor fireplace of your dreams! Contact us today for an estimate!